This Cake topped with white chocolate buttercream and mousse-like cream filling melts in your mouth with luscious, velvety creaminess. On the 11th March Elia, my daughter turned 25. When I asked her what kind of cake she wanted she told me anything with white chocolate in it. 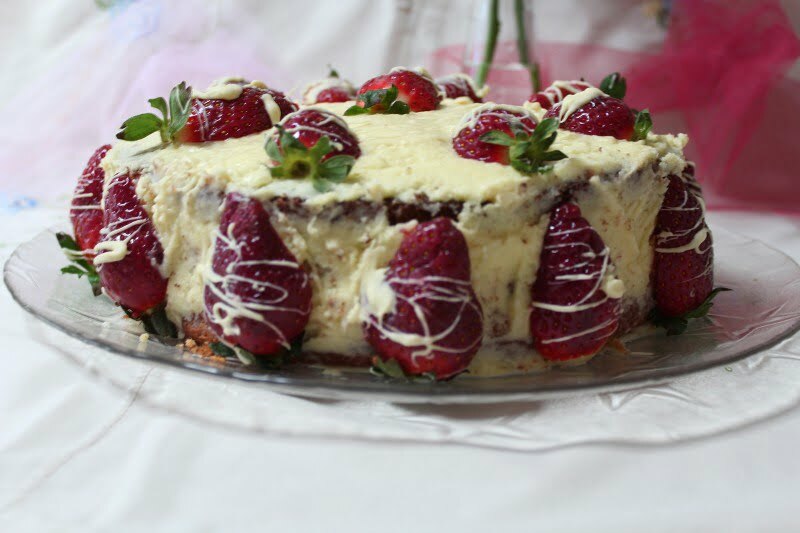 So, I came up with this Strawberry and White Chocolate Buttercream Cake and Strawberry Cream filling. Strawberries, are not in season yet, but with greenhouses they have appeared in the market since last month. I wouldn’t otherwise buy to eat them until late April or May but we love them when they are made into a coulis and have used them in many of the cakes I made in the past. The sponge is the usual Basic Sponge Cake which I made the day before and cut it into three slices with a serrated knife. The buttercream is something I did for the first time. I made a buttercream with butter at room temperature and icing sugar, I melted white chocolate which I let it cool before using and whisked some heavy cream to make whipped cream. The heavy cream was added to the buttercream and when the white chocolate cooled, I gradually incorporated it in the buttercream, which was flavoured with vanilla. Whilst the white chocolate was cooling, I washed 12 strawberries, which I dried with kitchen paper, cut them in half and put them on a tray with parchment paper, cut side facing down. I then drizzled some of the melted chocolate on top, as decoration. I refrigerated them for the chocolate to set before using. I prepared the Strawberry Coulis in which I did not add any alcohol but instead I substituted it with water. I soaked some powdered gelatine which I added to the coulis, while still hot. Before using the coulis, I let it cool until it started gelling. To assemble the cake, I used the ring of the spring-form baking tin in which I baked the cake, which I placed in a platter to hold the cake and prevent the filling from coming out of the sides. I cut the sponge in three pieces which I wet with some of the strawberry sauce and began layering the first layer, starting from the top layer and ended with the bottom layer being on top, so that I could get a smooth surface on top. When the coulis started gelling, I removed half of the white chocolate buttercream in another bowl to use for decorating the top layer and the sides of the cake. In the other half I added the strawberry coulis which I whisk until incorporated in the buttercream. This was equally divided between the two layers. I let the cream set and then removed the ring and the parchment paper and decorated the cake with the leftover buttercream. I finally decorated the cake with the strawberries. I must say that this turned out to be an amazing cake. The white chocolate buttercream tasted fantastic and the the mousse-like texture of the filling melts in your mouth with luscious, velvety creaminess. I recently bought my first Canon DSLR camera, nothing fancy but the cheapest in the Greek market. Nonetheless, it’s a dream coming true since it’s something I wanted from the first day I started blogging, almost ten years ago. To be frank my blogging mojo reached a point where I was dreading at the thought of having to write another post. I was thinking to stop blogging when I reached the ten years anniversary in August. However, photography is something I have always loved but now with this new camera, photography will definitely give me a new interest to continue blogging. I am already taking an online course to learn my DSLR camera and simultaneously learning how to use GIMP, a free photo manipulation program, as I can’t afford either Photoshop or Lighthouse. I have only completed 10% of both courses, so I hope that you will forgive my first attempts to use my new camera on manual mode. Some of the pictures are really off focus but I wanted you to see them any way! I took hundreds of photos the first day I made the cake but I haven’t found a decent one. The next day, when we cut the cake again I took a lot of photos which were useless. I was thinking that it was a pity I would not post the recipe because of the bad photography, so I continued watching a few videos about aperture, shutter speed and ISO. Yesterday, I had some free time, so I took all the time I needed to take tons of photos by experimenting. I think I have taken a couple decent ones. Buttercream: Same as above but with rose cordial. Add a couple teaspoons until you get the desired colour. Prepare the Sponge Cake and cut it into three slices. Wet it with strawberry syrup. Prepare the Strawberry Coulis, using 330 grams strawberries. Soak the gelatine with water for five minutes and add it to the coulis. Set aside to cool. Whisk the Heavy Cream until peaks form. Refrigerate until ready to use. In a double boiler, melt the chocolate and set aside to cool. Beat the butter with icing sugar until light and fluffy. Add the whipped cream and the melted chocolate and whisk until incorporated. Divide the mixture in two equal parts In half of it add the strawberry coulis and whisk until incorporate. Place the ring of the baking tin in a platter. Add the first slice of sponge and half of the strawberry filling. Add the middle layer and add the remaining strawberry filling. Cover with the third layer and remove the parchment paper. Remove the ring and decorate with the remaining buttercream and the strawberries. Please read the description given in the post for more instructions regarding the preparation of all steps. The cake looks really beautiful! Perfect for the combing strawberry season. The way you have captured pictures, I Cant wait to make it in my home, Thanks for sharing your knowledge ! I absolutely love this dessert recipes one of my all time favorites. Awesome article on strayberry cake . It will be a guideline to make a delicious cake like this. Keep writing.